KILLIAN K. VAN RENSSELAER. 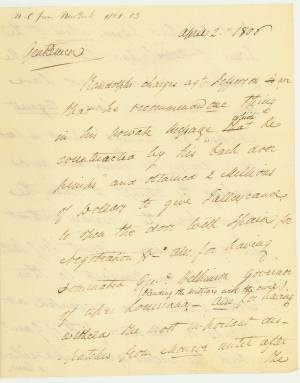 Autograph Letter Signed, April 2, 1806. 4 pp. On December 3, 1805, Thomas Jefferson sent his fifth annual message to Congress. In that document, he proposed strengthening the militia and the Navy in response to the actions of European powers, including Spanish activities along the Florida-U.S. border. 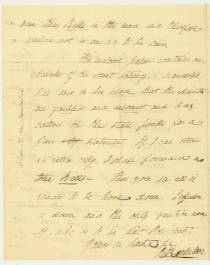 Three days later, Jefferson sent a confidential message to Congress recounting troubles with Spain arising from the Louisiana Purchase, and suggesting that France could arbitrate a boundary settlement over Spanish-held Florida. The House referred the president’s secret message to a select committee chaired by John Randolph, whom the administration had unsuccessfully tried to oust as Ways and Means Committee chairman just a few days earlier. Meanwhile, Jefferson confided to Congressman Barnabas Bidwell and Secretary of the Treasury Albert Gallatin that he wanted Congress to pass a series of resolutions regarding Spanish offenses against the United States, after which Congress would secretly appropriate two million dollars to purchase Florida. Randolph convened the select committee on December 7, 1805, and Bidwell introduced a resolution authorizing the appropriation. Randolph believed that this reeked of intrigue and was thus a betrayal of Republican party principles; he quickly adjourned the committee. In subsequent meetings with Jefferson, Secretary of State James Madison, and Gallatin, Randolph stated that he would never support the secret appropriation. 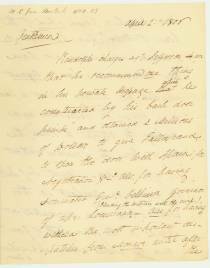 On January 11, 1806, the House voted down Randolph’s report and three days later approved Bidwell’s resolution. Randolph’s split with the Jeffersonian Republicans was now permanent. On January 27, 1806, the U.S. Senate confirmed by a vote of 17 to 14 the appointment of the controversial General James Wilkinson as governor of the Louisiana Territory. Wilkinson would soon be implicated in the Burr conspiracy, in which former Vice President Aaron Burr apparently plotted the creation of an independent republic from lands of the Louisiana Territory, with himself to serve as president. Burr also may have planned to launch a military expedition against Spanish-held Mexico and incorporate that land within his empire. The inclosed paper contains our Minutes of the secret sittings. Randolph has said in his place, that the Minutes are garbled and incorrect, and has called on the state printer for a fair statement. If I can obtain an extra copy, I shall forward a true Bill. Thus you see, all is ready to be hove down. Jefferson is down, and the only question now is, who is to be next president! Killian K. Van Rensselaer (1763-1845) was born in New York and attended Yale College. He studied law and was admitted to the bar in 1784. He served as a private secretary to General Philip Schuyler. He served as a Federalist in the U.S. House of Representatives from 1801 to 1811, when he returned to New York and the practice of law. This Killian was a descendant of Kiliaen Van Rensselaer (1586-1643), a diamond and pearl merchant from Amsterdam, who became a founder and director of the Dutch West India Company, and the only patroon successful in establishing American settlements. (Patroonships were large tracts of land with manorial rights granted to individuals to encourage Dutch colonization and settlement in New Netherland.) When the English assumed control and New Netherland became New York in the seventeenth century, Rensselaerswyck became an English manor containing all of the land around Albany, New York, along both sides of the Hudson River. Alexander Hamilton’s mother-in-law was another Van Rensselaer descendant. John Randolph (1773-1833) was known as John Randolph of Roanoke to distinguish him from kinsmen. A diminutive man of mercurial temperament, he engaged in several duels, including one with Henry Clay that arose out of Randolph calling the Kentuckian a “blackleg” for his role in the controversial 1824 presidential election. From 1799 Randolph served intermittently in Congress until his death, including as a manager of impeachment proceedings against Judge John Pickering and Supreme Court Justice Samuel Chase. In 1806, Randolph broke with Jefferson and James Madison and headed an arch-conservative Congressional faction called “Tertium Quids,” Latin for “The Third Somethings.” The Quids insisted on strict adherence to the Constitution and other “Old Republican” principles, and supported James Monroe over Madison in the 1808 presidential election. Randolph summarized Old Republican principles as “love of peace, hatred of offensive war, jealousy of the state governments toward the general government; a dread of standing armies; a loathing of public debts, taxes, and excises; tenderness for the liberty of the citizen; jealousy, [and] Argus-eyed jealousy of the patronage of the President.” Randolph was a member of the Virginia constitutional convention at Richmond in 1829, and he briefly served as Minister to Russia the following year. John Smilie (1741-1812) was a native of Ireland who served in the American Revolutionary War. He was a member of the Pennsylvania state legislature, and the U.S. House of Representatives (1793-1795, 1799-1812). Robert Smith (1757-1842) was a Revolutionary War veteran, lawyer, member of the Maryland state legislature, Secretary of the Navy (1801-1809), and Secretary of State (1809-1811). Charles Maurice de Talleyrand-Périgord (1754-1838) was a French prince and diplomat. Talleyrand was made Bishop of Autun by Louis XVI in 1788 and served in a number of influential posts, including in the National Assembly. His support for the new revolutionary France and his criticism of the Church led to his excommunication by the pope in 1791. However, he remained politically active as minister of foreign affairs, and was instrumental in drafting the French Declaration of Rights. He strongly supported Napoleon and helped prepare the coup d'état that brought him to power, but tension between the two was evident as early as 1805. In 1814 Talleyrand led the opposition, and sought to restore Louis XVIII. Talleyrand was primarily responsible for persuading the allies who occupied Paris in 1814 to return the Bourbon dynasty to the French throne. Louis XVIII, brother of Louis XVI, reappointed him to the position of minister of foreign affairs. Talleyrand is perhaps best known in the United States for his role in the XYZ Affair, in which he demanded bribes from a trio of American diplomats. Barnabas Bidwell (1763-1833) was a Massachusetts lawyer, state legislator, U.S. representative, and attorney general of Massachusetts. Around 1815 he moved to Canada and settled near Kingston, where he practiced law. He won a seat in the provincial assembly, but his opponents had him expelled for being an American citizen and fugitive, and having immoral character. He is buried in Cataraqui, Ontario. John Wayles Eppes (1773-1823) was a U.S. Representative and a U.S. Senator from Virginia and a son-in-law of Thomas Jefferson. He would defeat John Randolph in an 1813 congressional election. William Findley (1741/1742-1821) was a Pennsylvania legislator and U.S. Representative. Jacob Crowninshield (1770-1808) was a merchant, Massachusetts state senator, and U.S. representative. Jefferson had been re-elected in 1804. In the first half of 1805, James Monroe was in Madrid engaged in fruitless negotiations with the Spanish over the Florida boundary and other matters. In 1806, Madison was elected as the fourth president. Carnegie Book Shop, Cat. 237 No. 690, October 1959.